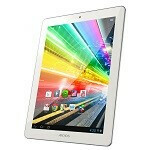 Today ARCHOS announced three tablets in its new Platinum Range covering different sizes and high resolution displays. All three tablets share a quad-core 1.2GHz CPU with an 8-core GPU, 2GB of RAM, Android 4.0 Jelly Bean, front and back cameras (albeit only 2MP rear, “webcam” front), mini-HDMI and support microSD. The only differences between the three are the screen sizes and their respective resolutions. The ARCHOS 80 Platinum will be available this month, and will cost $199. The ARCHOS 97 Platinum will also be available in February and will retail for $299. The ARCHOS 116 Platinum is expected to be available in April and will run $349. Speaking of screen resolutions, the 116 Platinum is packing a resolution of 1920x1080 IPS display which works out to 190ppi. That seems low given all the HD smartphones we have been seeing lately, but it is perfectly adequate for a larger display like this. The 97 Platinum is the jewel of the trio, with its 2048x1536 IPS display providing a respectable 264ppi. Finally the 80 Platinum, being the more budget friendly tablet has a 1024x768 IPS screen. If you have been looking for a basic form factor that covers all the bases in a tablet, this new Platinum line from ARCHOS may be worth considering. The 80 Platinum weighs in at just over a pound (1.05 lbs) and measures 7.9"x6"x0.38". The camera is only 2MP and there is also a front facing camera for video chat. This is the star out of the trio of tablets, featuring a 2048x1536 resolution IPS display. This one too comes with 8GB of storage and will support microSD up to 64GB. The 97 Platinum weighs just 1.47 pounds and measures 9.5"x7.3"x0.38". 2MP camera on the back. Rent a motel room and get someone to buy you a bottle of vodka. This way you can make your own prom which will be 100 times better and you'll have extra income for your tablet. It's a win win. I remember prom night last year, good times, I was harder than the back of a Nokia 3220. When will the Archos 80 come in India ??? "Android 4.0 Jelly Bean" ?! And there goes Archos again... Claiming an "8 core" GPU when they are obviously using the Mediatek MTK6589, with a PowerVR SGX544 SINGLE CORE. And of course not telling that the CPU cores are A7 and not even A9 If there are two companies that are good are selling air those are Mediatek and Archos. Thanks for the correction, as the A31 at least has a somewhat decent GPU compared to the Mediatek one. It may even be able to move so many pixels. But still, MP2 stands for two cores... Unless you want talk about SIMDs Where did you get the info from? Archos does not say much. Is there any concrete info on CPU and GPU ?